Important - Please Read: Obtaining Pre-Sales Technical Support: If you have pre-sales related product questions regarding any LanScape product, we ask that you post your questions to our customer support forum. You should post all pre-sales related questions to the appropriate pre-sales product area. Doing so will ensure the fastest possible response from the LanScape Technical Support staff. For more information regarding pre-sales technical support, please see the top of our web site home page. 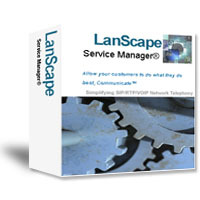 The LanScape Service Manager® suite is a software "package" that allows you to execute all LanScape VOIP server software and just about any other Windows 32 bit GUI or console application, batch file or script as a native Windows NT service or as a Windows 2000,XP,2003 service. This has many advantages over simply developing and running your server software as a native service or as a standard Windows application process. Just about any Windows application can be executed on the server host machine as an NT service or a Windows service. Batch files, script files, Windows console applications and a large number of GUI applications can successfully be executed as a service. If you are developing your application to be used with the LanScape Service Manager®, then you have full control over your application and can take steps to "design in" the necessary functionality that will allow your application to be 100% compatible with running as a service. There are only a few minor guidelines you must follow to make sure your applications are able to be started as a child process of the service manager and stopped gracefully when the host system gets shut down. The primary advantage of running your Windows applications as a service is that the application will be started when the host machine is started. It does not matter if a user logs into the server machine or not. The application will also automatically shutdown gracefully when the server host machine shuts down. There are many other advantages of running server software as a service. When you run your server software as a service, your server software can be monitored for execution faults and can be restarted if required. Deploying server software as a service will assist you in deploying a "high availability" system that will experience minimal down time as compared to server products from other vendors. Allows you to execute GUI or console applications, batch files or scripts as a service. Can manage a single "application process" or as many as you configure. There is no limit. Can be configured to restart your application in the event that it unexpectidely crashes. Can be configured to restart your application using a scheduled periodic interval set by you. DETECTS UNHANDLED EXCEPTIONS: Can monitor all configured processes for unhandled exceptions. If an unhandled exception is detected, your application/process can be restarted. Full service event logging to a local log file or to a remote log server (remote console log server included). Allows you to develop your software or application as a "normal" application which is simpler than developing a Windows service. A simple intuitive easy to use interface with compiled HTML help documentation. LanScape offers free support for this product for 30 Days after the purchase of a product license. Free product and development support is conducted using the LanScape support forum. If officially scheduled product upgrades are available within the free support period, you will receive free product upgrades. If you report product bugs during this free support period, LanScape will resolve the issue at our discretion depending on the severity of the problem and MAY reissue you a new product image. If free support is not sufficient, then customers can enter directly into a paid "Enhanced Customer Support" agreement with LanScape. At LanScape's sole discretion, the free support period may be extended for certain customers. If customers need additional support after the free support term expires or if a higher level of support is immediately required, customers may enter into a support agreement with us so that we may assist you further. For complete details associated with obtaining additional paid (enhanced) support, please contact LanScape support via email to request the current "Enhanced Customer Support" agreement. The support agreement outlines our current support capabilities and framework. Final paid support terms can and will be tailored to your exact requirements and needs. If you would like to evaluate the LanScape VOIP Media Proxy™ Server prior to making a purchase, you can request a trial product license. For complete details, please see our "Test Drive" page. You can request a trial for one of the three supported versions: Personal, Professional or Enterprise. The trial products come complete with all user documentation and information you will need to make an informed decision. Understanding what has been added, fixed or improved upon will help you get the most out of the LanScape VOIP Media Proxy™ Server . For complete version history details, please read the following Version History Documentation. In order to make your purchasing decision easier, the complete Service Manager™ Suiter product help file is available via the web. Performing a quick review of the product's help documentation will give you a great overview of the power of this product. LanScape customers who have a previous version of the Service Manager can upgrade their softwre for free. Please contact LanScape support for additional details. Please go to our online store. From LanScape's online store, you can purchase the Lanscape VOIP Media Proxy™ Server that will meet all of your VOIP network requirements.